2014, SWAY Art Yarn Guild Florida, Festival time! It was my first foray to the United States and I couldn’t have had a better place to land 🙂 What a fantastic group! I came prepared, I had my workshop program and a handful of challenge cards to kick off with some fibery fun and games. Literally…. games 🙂 These were cards I had created previously, but had not had the opportunity to try out with such a large group, I believe there were 70 people attending that year! And now I am going to try them out with an even LARGER group – everyone reading this post in fact! Well ok not exactly, because many of them require you to be in the same room, BUT hows this for an idea, please feel free to download and print these cards, take them with you to your next guild meeting, or spin group meeting, or any spin day with any size group. There are a total of 14 challenge cards. 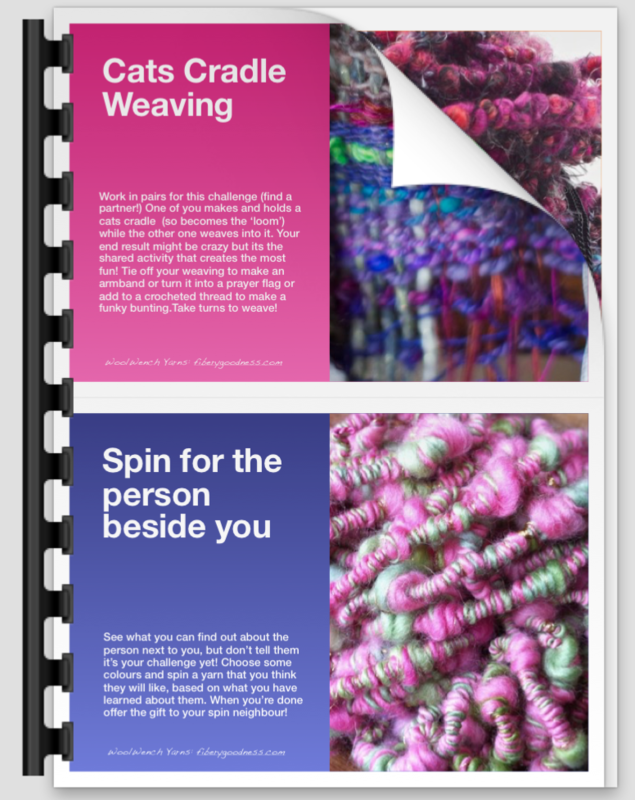 Share them around and see what you can make with them 🙂 They are just for fun, to get you doing something different or unusual, and to work together with others! We are often such solitary creatures aren’t we, in our spinning.. Its great to branch out every once in a while and be a party animal instead, I double dare you! If you use them, please mention me and Fiberygoodness as the originators, and you know what, I would love it if you would come back and share your experiences with the cards, either here on our my facebook page! If your group creates some magic with them please do let me know, this is a little like releasing my baby birds into the wild, its great to know where they end up! So without further ado – click the image to get the entire download! Have FUN! Oh I just love this!! 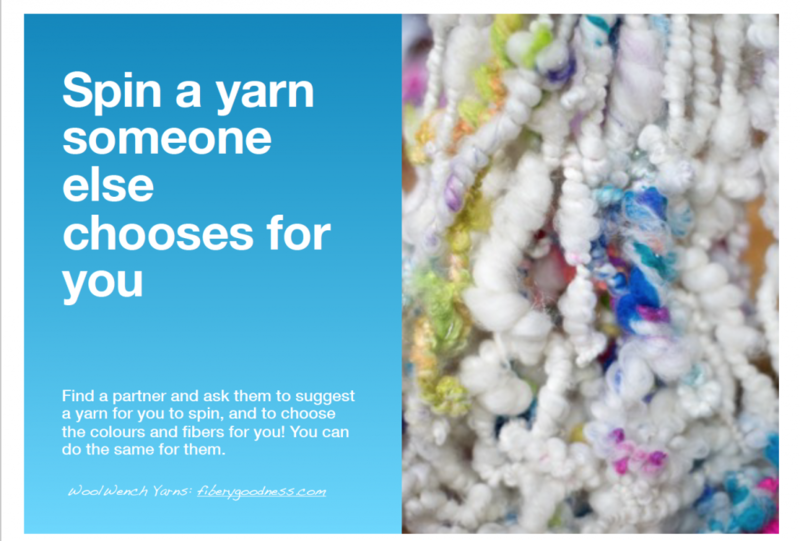 Having another person pick what you spin helps get one out of their normal color zone and their plan but go with someone else’s. Letting go of the reigns a little bit so to speak and stepping into some new shoes. What a cool idea! I hope there will be games like this for the new evolution too! Oh yeah, thanks for sharing. I can’t wait to use some of these at our monthly spin in. This is going to be fun. Lovely ideas, I’ll take this to our guild meeting on Monday!